CAN-FAN ISOTX Acoustic grow room fans are extremely quiet and are built to Ruck’s high standards utilising Swiss/German made motors and construction. CAN-FAN Acoustic ISOTX Insulated Inline Fans are constructed for reliability and designed to minimise noise output at range. The fan range is insulated to minimise noise pollution. The high quality metal casing features a removable top plate for easy accessibility to fan section and mounting fixtures on the base to enable the unit to be fixed to a wall or ceiling. Sound insulated boxed fan 100 % Speed controllable. Easy removable fan section. Forward curved motorized impeller. 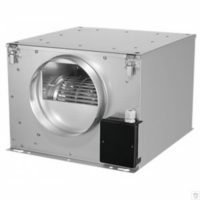 To calculate how big a fan you will require: Simply multiply the length x width x height of your growroom in mtrs which will give you the cubic capacity of your room ..and then multiply that value by either 30 or 60 which is the minimum and maximum air changes required per hour for optimum ventilation in your growroom. For example : A growroom measuring 2mtrs x 2mtrs x 2mtrs = 8mtrs cubed x30 air changes an hour = 240mtr cubed per hour will need to be ventilated ..as a rule we recommend buying a slightly larger capacity fan than you need, to allow for summer increases in temp and or using a Carbon filter.